So far M/S BIBIANA has sailed with to different ships; M/S SAMKA and Activ. In 2016 and 2017 M/S BIBIANA sailed with the ship M/S SAMKA. SAMKA is af coaster from 1956, build on H. C. Christensen steel shipyard in Marstal, where the ship is also in harbor. SAMKA is a part of a series of 23 coasters from the 1950’s, of which the first ship was named CAROLINE, and thereby named the entire series. SAMKA is also one of the two original Caroline-coasters, that is still in Danish hands. After serving as a cargo ship under two different owners, SAMKA was, in 1997 taken over by af local conservation association in Marstal. Besides taking care of the ship, the association uses SAMKA as an exhibition ship. Freight in Norway, Poland and Denmark. Through the years SAMKA has sailed with freight to many different cities, by many different routes. For instance, the ships has sailed to Norway with wood and salt, transported gypsum to cement production between Denmark and Poland, and sailed cereal, wood and sisal to Danish harbors. When SAMKA sailed as a cargo ship, the crew consisted of 5 persons: A skipper, a mate, two men on the deck and furthermore, a younger man, who worked as ships’s cook. 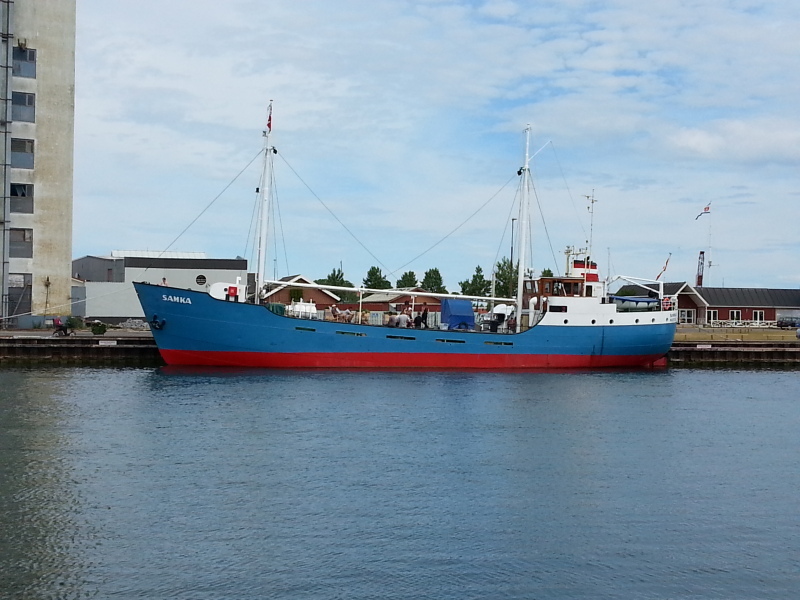 When SAMKA was built in 1956, it was financed by its first owner Arne Flyvbjerg from Nørresundby. Flyvbjerg could have chosen to let his ship build in Germany or the Netherlands, but because he was patriotic of mind, he was determined to build the ship in Denmark. When the ships was built, it was Flyvbjerg’s 11 years old daughter Ane Mette who named it. With the words “Sail the sea with honor – SAMKA is your name”, she initiated the ship. Afterwards the ship was celebrated with wine and cigars. The name SAMKA is created with the initials from every member of the Flyvbjerg family. S for the the son Svend, A and M for the daughter Ane Mette, K for his wife Karna, and finally A for Arne. The former owner Erik Nielsen sold SAMKA, in 1997, to “The Caroliner Association M/S SAMKA” because the ship didn’t give him a big enough profit anymore. Unfortunately the association ran into economical challenges and SAMKA surpassed to the association “The Museum Association for the preservation of M/S SAMKA”. The museum associations collaborates with the maritime museum in Marstal and is backed by private funds. 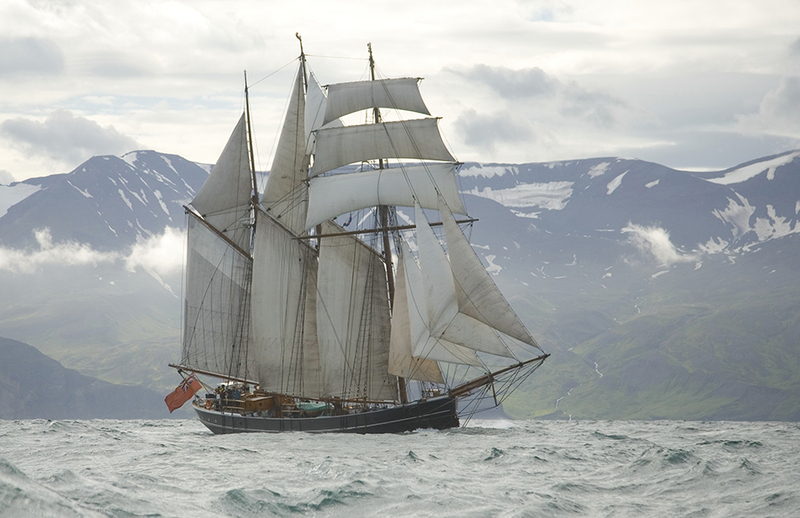 The ship preservation fund has declared SAMKA as worth preserving and an important part of the danish maritime history. In 2015 M/S BIBIANA sailed with S/V Activ. S/V Activ was originally built as an Arctic Ocean ship in 1951 at the Ring-Andersen shipyard in Svendborg, for the shipping company A. E. Sørensen to use in Greenland. The ship is the last, historical ship, that still makes expeditions to arctic regions of the world. S/V Activ was originally rigged as a ketch, which means, as a two mast ship with a yacht’s hull and furthermore rigged with a gaff sail. The ship has a load capacity of 211 tonnes and the length of the deck is 29,4 meter, the width 7,2 meter and the depth 3,35 meter. The ship is built in oak from up to 160-200 year old trees. East Greenland, Ammassalik and Copenhagen. In the time period between 1958 and 1965 Activ sailed coastal voyages in East Greenland. When the atlantic ships arrived from Copenhagen or Reykjavik, Activ sailed with supplies to the settlements. Moreover, the ship was, on a regular basis, included in the packet service between the North Atlantic brygge in Copenhagen and Ammassalik in Grønland. The ship’s first owner var shipmaster R.P. Sørensen, who named the ship Mona. In 1953 the ship was bought by A.E.S., who changed the name to Svendborg and put it on the Greenland shipping under Royal Greenlandic trade in 1958. The ship got it’s current name; Activ, in 1963 when it was sold to Einer Sørensen. Einer Sørensen sailed freight with Activ until 1976, where the architect Volkwin Marg bought the ship. Marg kept the name Activ, for the ship, and rigged it into a topsail schooner in 1978-1980. With great aesthetic sense, Marg rebuild the ship to make it look like a freight ship from the 1800s, but what used to be a cargo hold, is today made into cabins, a saloon and a pantry.